*Please note, rink condition is weather dependent. Neighbours are welcome to use the rinks at their own discretion, but may need to clear the ice themselves. We have two ice areas available for some skating fun this winter. 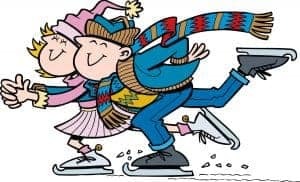 Community Members and guests are welcome to skate and play shinny on in the enclosed tennis courts or enjoy a family skate on the snowbank rink right next to it. Please be advised that both rinks are *unsupervised, so please take care. - ALL children under 18 should be wearing some type of protective headgear, and it is suggested that all adults wear protective headgear as well. - Skating is welcome until 9PM at night. Lights will be on from approximately 430pm - 9pm. - All skaters use the facility at their own risk - please be careful and safe out there! A list of the rules and guidelines are listing on the door access to the area. Please read them - and have a great skate! *The Highlands Community League is not liable for any injury guests may incur while using our skating facilities. Any lost items found will be kept in the league's Lost & Found box, located in the Sports room of the community hall. Contact our facilities director via email if you have any questions or want to check the Lost & Found box. The annual Christmas Day hockey game on the old hockey rink.